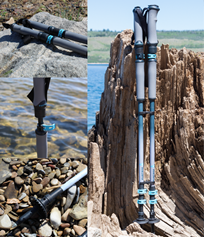 Utah companies, PureTrek & Swarm Design, have developed the the worlds first trekking pole water purifier. It combines two must have hiking products into one quick and easy to access water filtration system on the go. PureTrek was founded by Kyle Stringham, a Utah native. The product was born out of necessity as Kyle spent time outdoors. “As I worked through the madness of filtration systems it came to me. What’s always in your hand when trekking and has always just had one function?. A Hiking stick or pole! And what do I always dread or put off until last minute? Hydrating! So I developed a quick and dependable yet simplistic approach to hydration- a trekking pole combined with an inline water filtration pump that can draw pumped water from the end and out the top ready to drink.” Read more….